I'm going to be honest with you, readers, I am not in a good place with this blog at the moment. It's supposed to be an affectionate and light-hearted diary of my National Trust adventures, with some scones thrown in as a common denominator. I want every scone to be a 5-star lump of gloriousness. I don't want to criticise anyone's work or make them annoyed or sad. 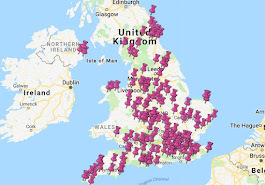 And the very good news is that the secret of scone gloriousness is actually very, very simple; having now visited 110 NT properties, I can tell you that the one single factor that almost guarantees enjoyment of a scone is freshness. Scones need to be baked fresh on the day. That's the secret. 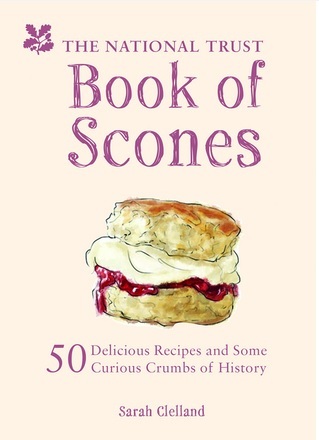 The National Trust has been standardising the scone recipe across all of its properties for some time. If this is to cut costs, then OK - it's a risk, because people will stop buying them if the quality drops, and it's kind of a shame to lose the individuality of each property - it's always been part of the fun for me. But I get the need to try for efficiency. But if it's to improve quality, then it's failing. Both scones I had today were poor. 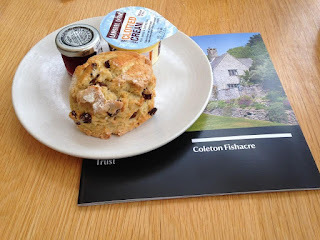 The Coleton Fishacre scone was inedible. If the NT wants to standardise scones to improve quality, then don't worry about the recipe; focus on making sure they are fresh. If scones are not baked fresh on the day, a cream tea is not worth £4.20 in my mind and I'm not going to waste any more of my money on them. Anyway - ENOUGH of this. This is a blog about scones, not the refugee crisis or Brexit. 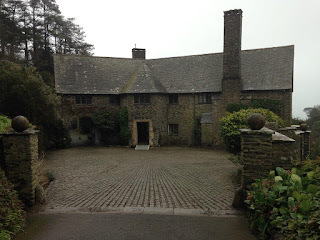 Coleton Fishacre was built in 1923 by Rupert and Dorothy D'Oyly Carte. Rupert was the son of Richard D'Oyly Carte, the theatre impresario who made a huge success out of Gilbert and Sullivan, and who also built the Savoy Hotel. I loved the way that the building is curved towards you when you arrive - see picture above. It's very inviting. It was constructed to maximise its exposure to the sun on the seaward side, apparently. And although it's built in the Arts and Crafts style, using local materials to embrace the natural surroundings, the driveway was designed so the D'Oyly Cartes could turn their Bentley around. The interior of the house is very striking but also quite austere. 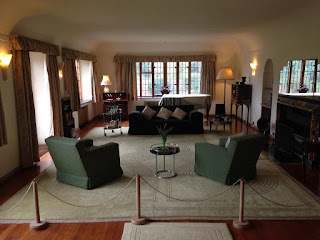 We had also been to Greenway today, which was Agatha Christie's summer home, and yet it was Coleton Fishacre that felt more like a temporary summer residence. I had never seen a wind dial before and I was transfixed by it. It has gone on to the list of National Trust Things That I Would Like in my House. Also on that list: the Tudor donkey wheel from Greys Court. The word 'loggia' is one of the thousands of words that I recognise but if you asked me to explain it, I'd be stumped. Coleton Fishacre has a loggia, so I looked it up and it's basically an outdoor sitting room. It's lovely. It has a huge table there for everyone to eat outside, while sheltered from the elements on three sides. There's a theme developing here - see our visit to Greenway again - but we didn't see much of the garden at all. It was February, it was raining, but it's no excuse - we'll have to go back in the summer and marvel at the views out to sea. I'm not going to say much more about this. It looks nice but if you look closely you can see that it doesn't look properly baked. And it was very dry. But Coleton Fishacre itself is a fantastic place and I highly recommend it. Go early in the summer is my advice. I'm disappearing for a while, but I've got a big NT trip planned in March and another extravaganza in April, so we'll see how they turn out! Well... I couldn't agree more about, to me, the horrors of the recipe being standardised across the board.. shudder.. I love the individuality of each property and I've come across some 5* plus plus scones and equally some minus -1 scones. Soft fluffy and NOT dry on the inside, and a little bit crispy on the outside.. ideal.. but but but .. they MUST be baked on the day.. there is no other way! It's turning into a bit of a fiasco already, mainly through my own ineptitude! But onwards and upwards! Certainly NOT due to your ineptitude!!!! Don't worry about the bad scones -its the scone that is the problem, not you or the NT staff & volunteers. If its bad they need to know.